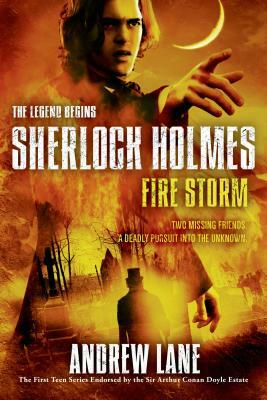 In Fire Storm by Andrew Lane, young Sherlock's friend and her father have vanished. Their house looks as if nobody has ever lived in it; the neighbors claim never to have heard of them. Sherlock begins to doubt his sanity, until a clever clue points him to Scotland. Following that clue leads him into a mystery that involves kidnapping, bodysnatchers, and a man who claims he can raise the dead. Only the budding detective Sherlock can untangle the mind-bending—and dangerous—puzzles that ensnare his friends. Think you know Sherlock Holmes? Think again! Andrew Lane is the author of the Young Sherlock Holmes series of young adult novels, starting with Death Cloud. He has also written numerous spin-off novels based on the BBC sci-fi television series Doctor Who, as well as definitive guides to Babylon 5 and the Wallace and Gromit films, and is the author of The Bond Files: An Unofficial Guide to the World's Greatest Secret Agent. He lives in Dorset, England.